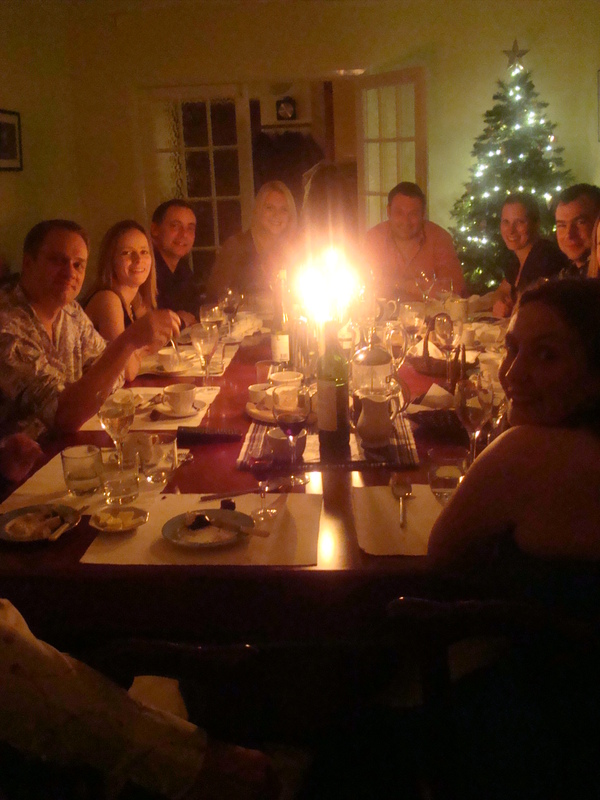 This was our one supper club that survived the December snow, a private event booked a year ago, and one which required us to pack up our boxes and bags and head off on tour along the A55 to Llandudno and the home of St. David’s College headmaster Stuart, to celebrate his 40th birthday. The origins of this booking go back even further, to the summer of 2009 to be exact, four months before I’d even started the secret supper club. It was the St. David’s College ‘Auction of Promises’ an event scheduled to raise funds for the schools charity project in Uganda, specifically to build a maternity unit. 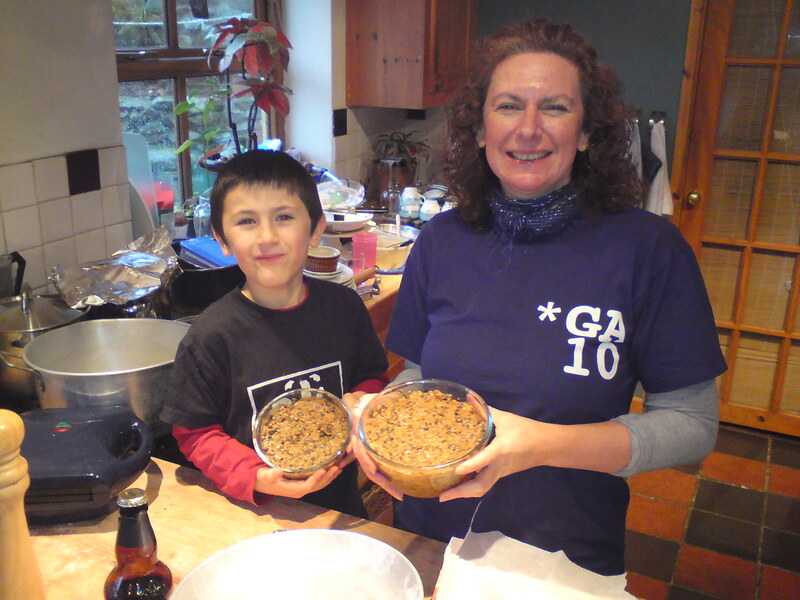 At the time I’d mentioned to Sean (my other half) that I would like to give something or help in some way and I came up with the idea of donating myself, or at least my skills and time to cook and prepare a dinner party for up to ten. The auction came and I was somewhat nervous at the thought that no one would bid for me and even more nervous when the headmaster won me!! But as I said, this was a year and a half ago and following this we’d been unable to find a date that suited, until Stuart asked if I would cook at his house for his birthday. So the dinner became my fulfilment of the commitment I made at the auction as well as staying true to the supper club ethos. 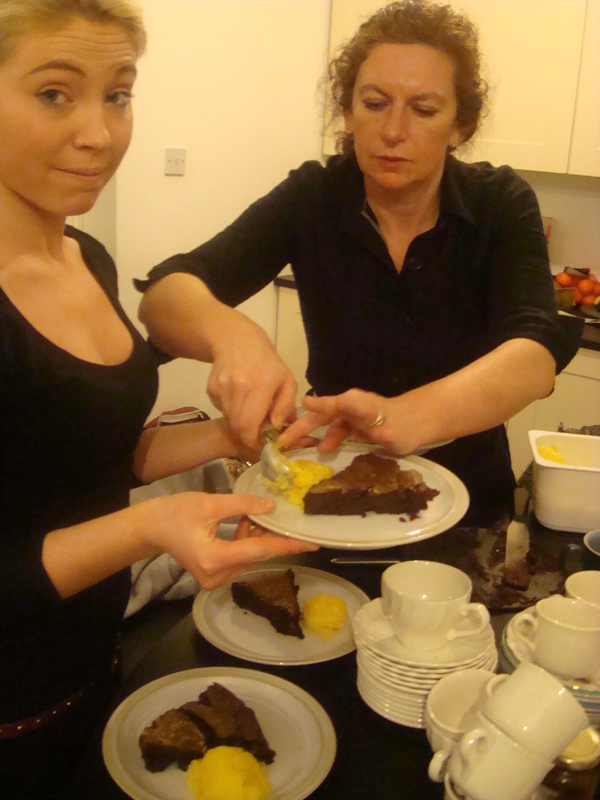 The only proviso was that no St. David’s pupils worked as waitresses (that ruled Roisin or any of her friends out) so Anya and her friend Emma came along to help. 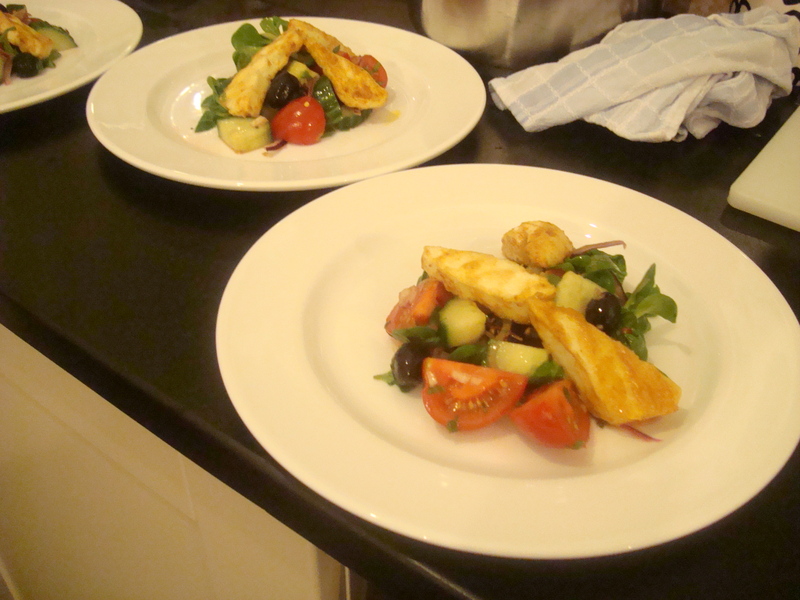 I got together with Stuart and we discussed menu, which ended up being based around his favourite dishes. 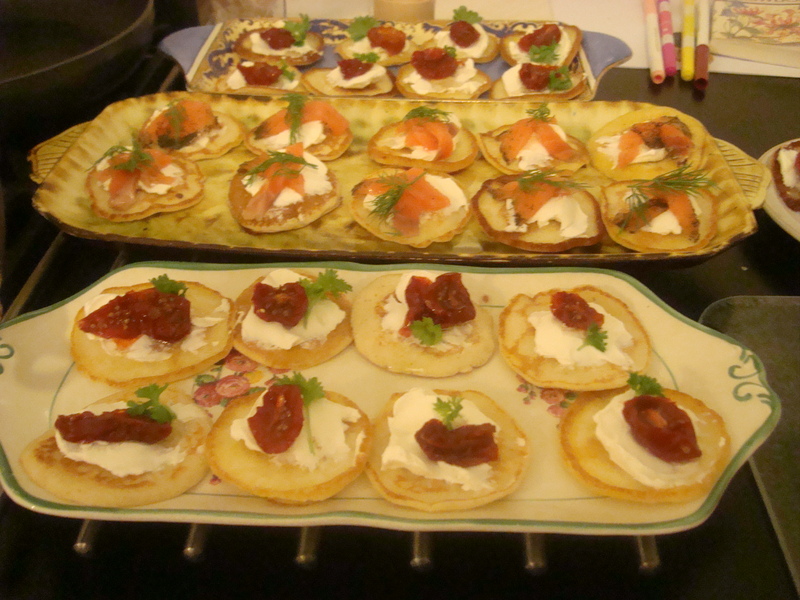 We started with Mini yeast blini canapes with sour cream, smoked salmon and dill or oak roast tomatoes from the tomato stall at Borough market, Champagne or Kir Royale. To make Kir Royale just add a dessertspoon of blackcurrant cassis to a glass of bubbly to give it a pink glow and a little sweetness. Then for starters we opted for a classic moules mariniere, with cream, thyme and parsley or smoked halloumi salad for the vegetarians and mussel haters, a dish I’ve made before for a previous supper club. For main course I did slow cooked lamb shanks with parmesan mash and broccoli (another dish I’ve served before) or an Ottolenghi inspired squash and chickpea stew with lemon couscous. We finished with a very dark and rich chocolate mousse cake (from one of my new Christmas recipe books) with bitter orange sorbet, followed by coffee, Port and cheese. Preheat the oven to 180 degree C/350 degree F/gas mark 4. Brush a 23cm loose bottom cake tin with some melted butter and dust with ground almonds. Melt the chocolate, caster sugar, butter and salt in a heatproof bowl over a pan of very gently simmering water. 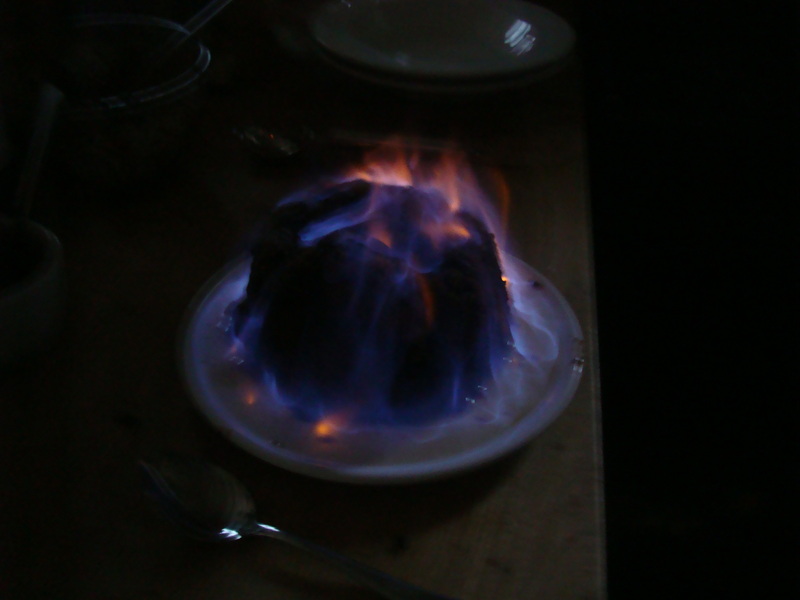 Once melted remove from the heat. Whisk the eggs with the ground almonds and when light and airy fold into the chocolate mixture which will begin to thicken after a few minutes. Pour into the cake tin and bake for about 35 to 40 minutes. When its slightly cooled remove the sides of the cake tin but leave the cake on the base. 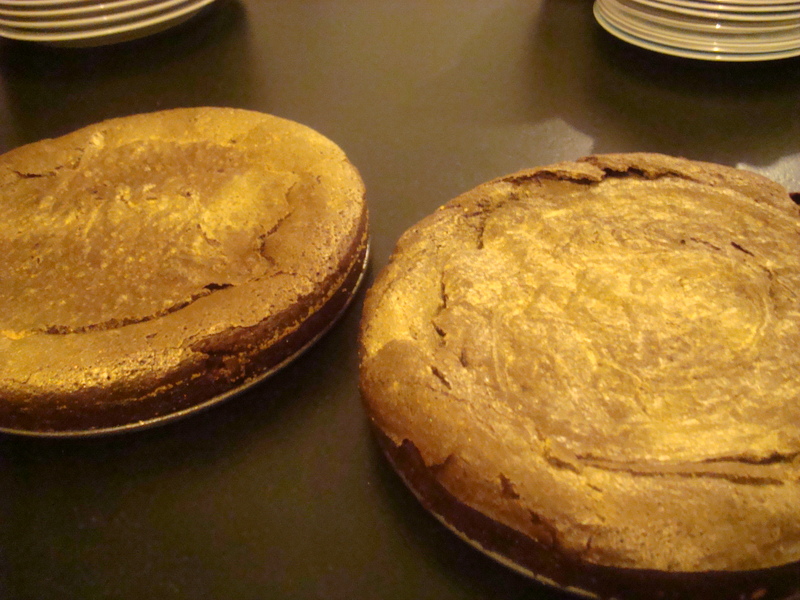 When its cold dust the top with a little sieved icing sugar or brush the top with edible gold dust. 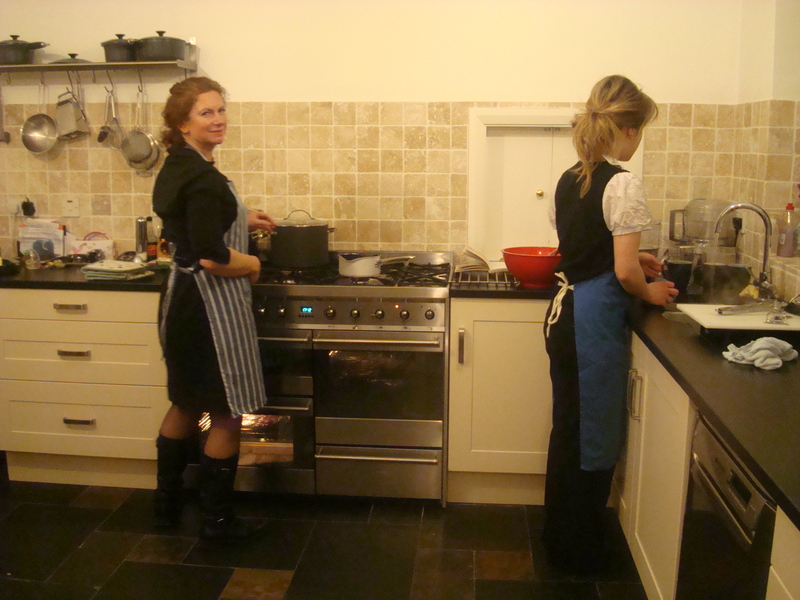 It seemed odd cooking at someone else’s house, although I have to say we soon got into the swing of it. 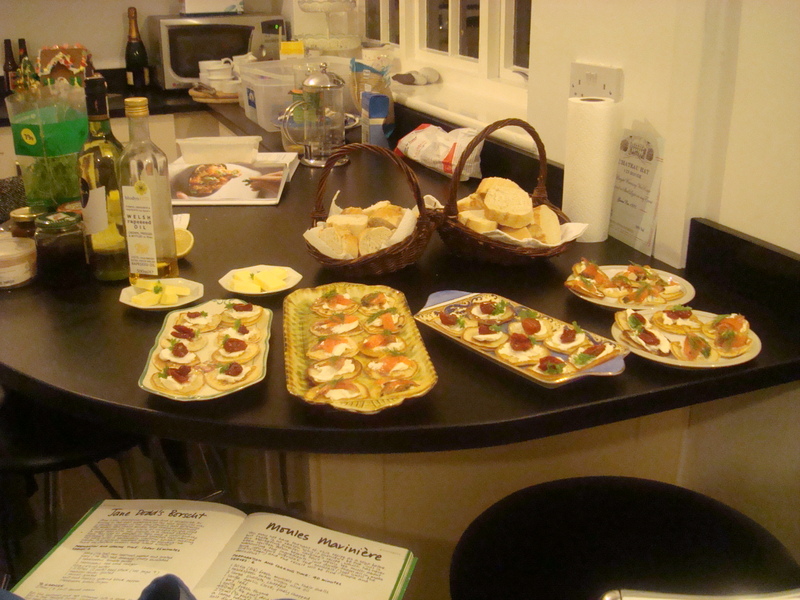 We had wine, drinks, music (Stuart’s partner Lucy lent us their young son’s ipod dock which he’d got for Christmas, which left us feeling very guilty as he scowled at us from the corner) and we had lots of space!! Emma got carried away with the ice machine on the fridge (ice in everything!) 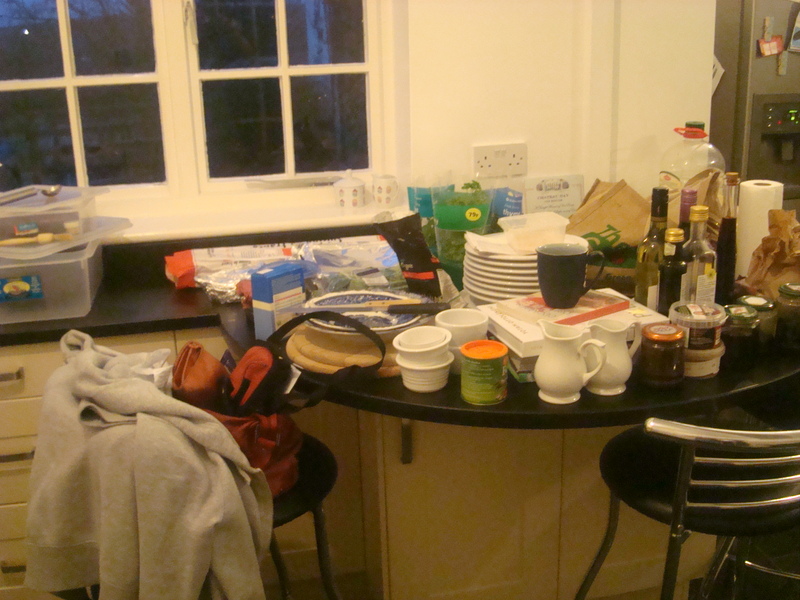 and I seriously coveted their work surface and made very the most of it, amazed at how much difference it made to ease of preparation. Stuart, his family and guests crept into their own kitchen sheepishly and almost apologetically at times, which was quite funny, and apart from the three of us still feeling shattered from Christmas, snow and various lurgies it all ran remarkably smoothly. 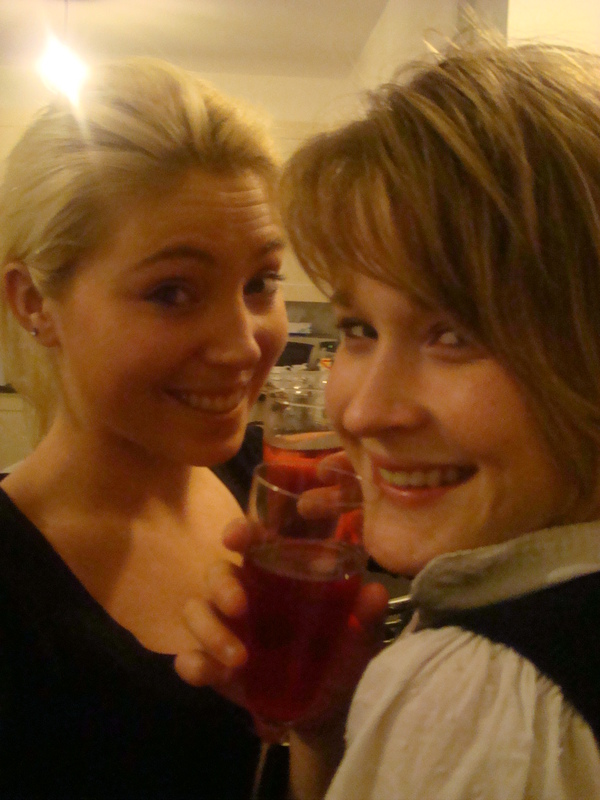 No really, it did and this surprises me because it was the first time we’d taken supper club on tour! 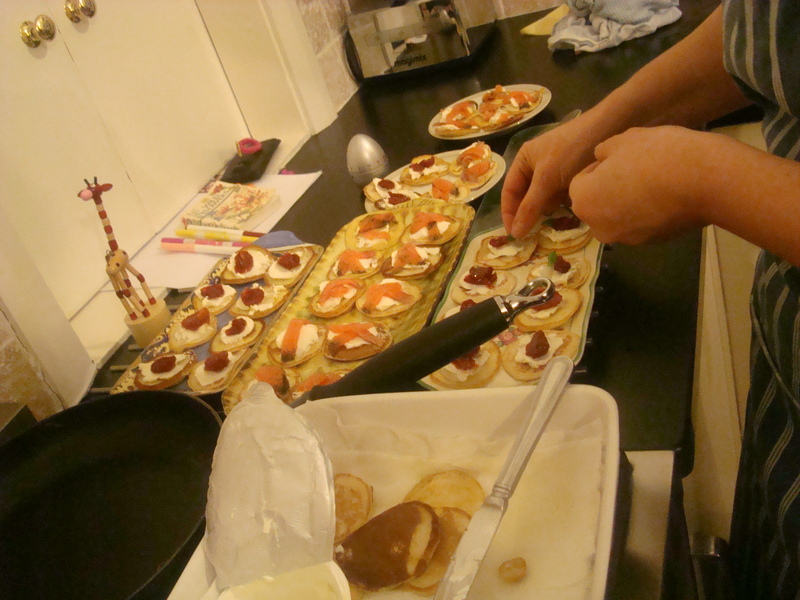 I avoided the wine and Champagne until the meal was underway, so everything took shape nicely. The girls were the perfect cocktail waitresses and I deliberately kept a low profile. I wasn’t sure for a time if it was weird cooking at the home of my daughter’s headmaster, but in the end it didn’t feel that way at all. 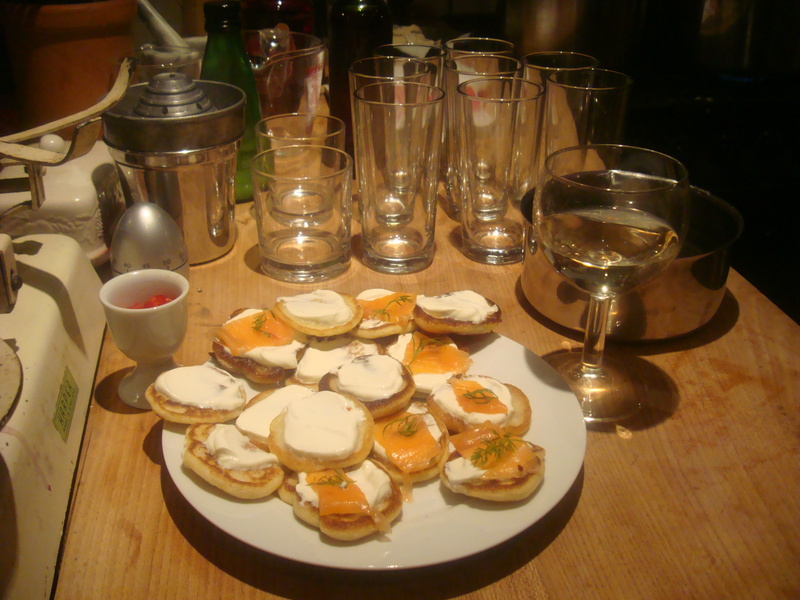 I thoroughly enjoyed the evening, the food appeared to go down well and as the girls and I left everyone eating cheese, drinking Port and coffee and about to head outside to their fire, they all seemed to have a full and happy smile on their face. In my usual style I forgot to photograph the mussels and the main course. I need a food photographer as I get too stressed about getting the food to the table hot to worry about whether I’ve taken a picture of it and when you have twelve lamb shanks to serve with mash the last thing on your mind is the photography! 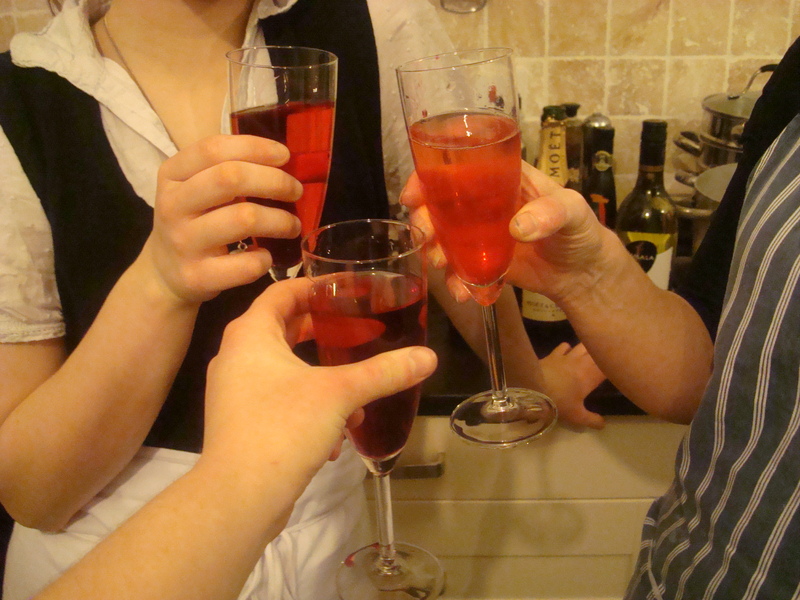 Kir Royale to celebrate being ready! doing what I do best...organising!! 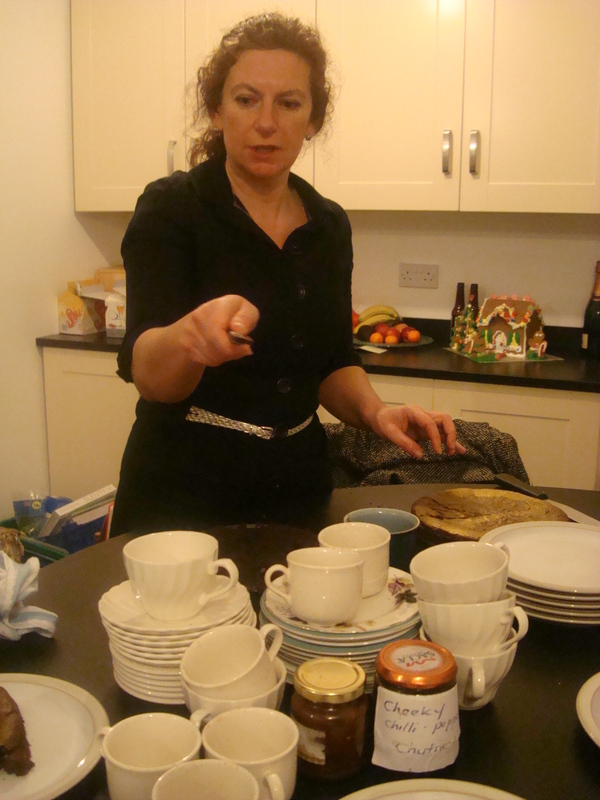 and looking rather scary brandishing my knife at some unsuspecting coffee cups! 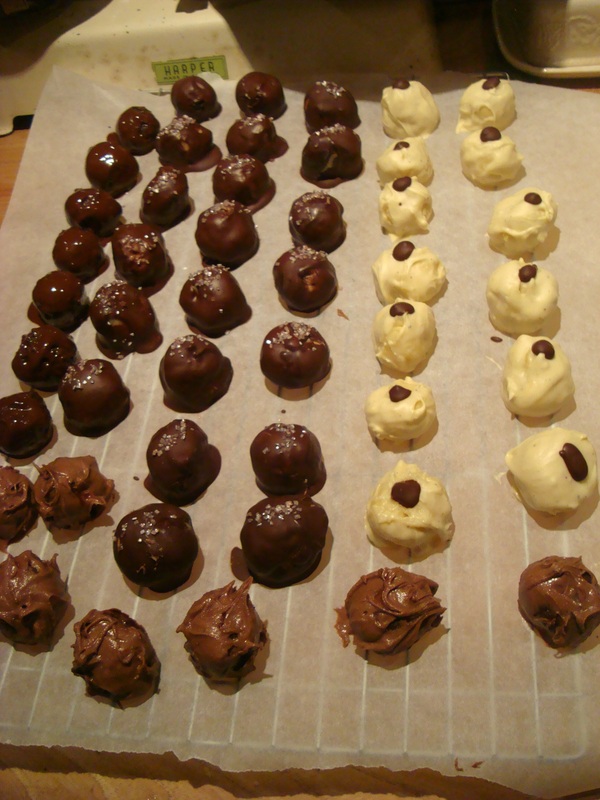 As we packed up in the kitchen one of Stuart’s friends came and thrust posh chocolates at us made by his sister, an artisan chocolatier, ganache truffles I believe they were and I had a ginger and lemongrass one. They were too delicious to just have one we had to take an extra for the drive back. It was a lovely end to a lovely evening. “Oh” she said crestfallen “is that all?” and she sloped off to bed.